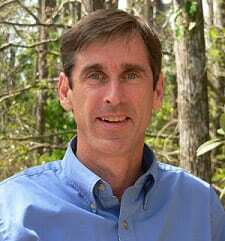 Dr. Patrick Bohlen is Director of Landscape and Natural Resources (LNR) and Arboretum, and Professor of Biology at the University of Central Florida. He received his PhD in entomology from Ohio State University in 1994 where he studied soil and ecosystem ecology. He was a research biologist at Archbold Biological Station in Lake Placid, Florida for 11 years prior to coming to UCF in 2010. The LNR department is responsible for landscape operations and natural resource management on UCF’s main campus, Lake Nona medical campus, and other UCF facilities. Other responsibilities include: landscape design and master planning, landscape installation and maintenance; landscape irrigation; management of natural areas and conservation easements; and storm water infrastructure. Dr. Bohlen also oversees the UCF Arboretum, which together with LNR, provides opportunities for relevant, experience-based learning, urban ecology research, and human connection with ecosystems and landscapes.